A CH-53E Super Stallion takes off the flight deck of the Royal Australian Navy landing helicopter dock ship HMAS Adelaide (L01) during an amphibious demonstration as part of the Rim of the Pacific (RIMPAC) exercise, July 29. US Navy photo. ABOARD HMAS ADELAIDE, OFF THE COAST OF HAWAII – Australia’s amphibious force was a breakout star of the Rim of the Pacific 2018 exercise, being thrust into visible leadership role when the U.S. Navy’s amphibious assault ship suffered mechanical failures and remained pierside for most of the at-sea exercise. 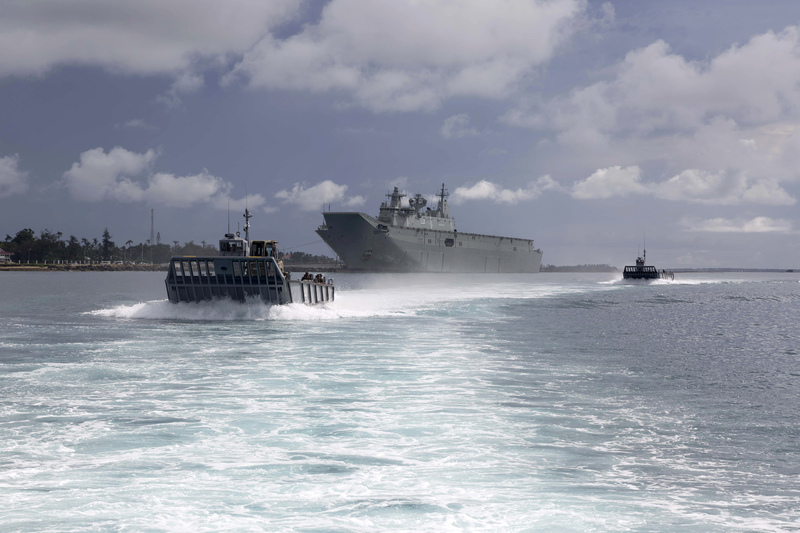 The unplanned spotlight, though, put on international display the progress the young amphibious force has made since a 2011 decision by the Australian Defence Force to build up a three-ship Amphibious Ready Group and an accompanying amphibious battalion in the Army. 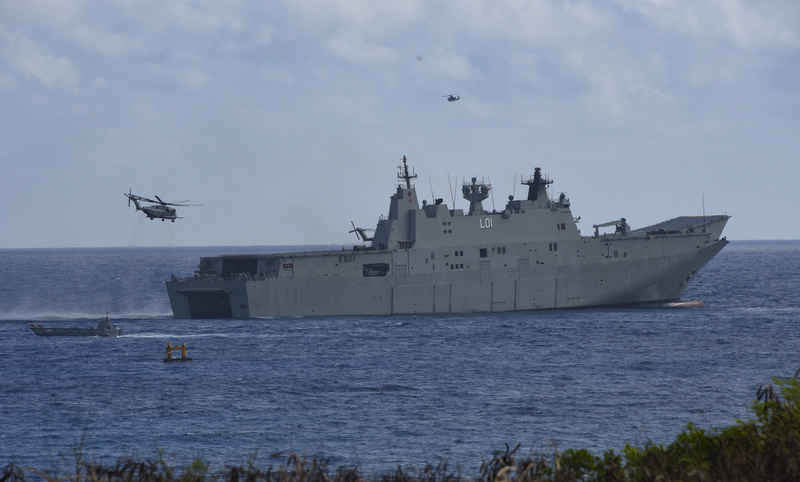 As landing helicopter dock (LHD) HMAS Adelaide (L01) led the flow of troops from ship to shore and back again in surface connectors and helicopters, it was clear how the Australian amphibious capability had grown more capable and confident even since the 2016 RIMPAC exercise, when sister ship HMAS Canberra (L02) made its first major international debut and the Army’s 2nd Battalion, Royal Australian Regiment (2RAR) was charting a path forward for its transition from infantry to amphibious pre-landing force. Now firmly in the “run” phase of its crawl/walk/run evolution, Australian amphibious force leaders say RIMPAC 2018 served as a nice challenge ahead of next year’s final test of the amphibious force: operating a three-ship ARG and accompanying ground force in the Talisman Saber 2019 exercise back at home. 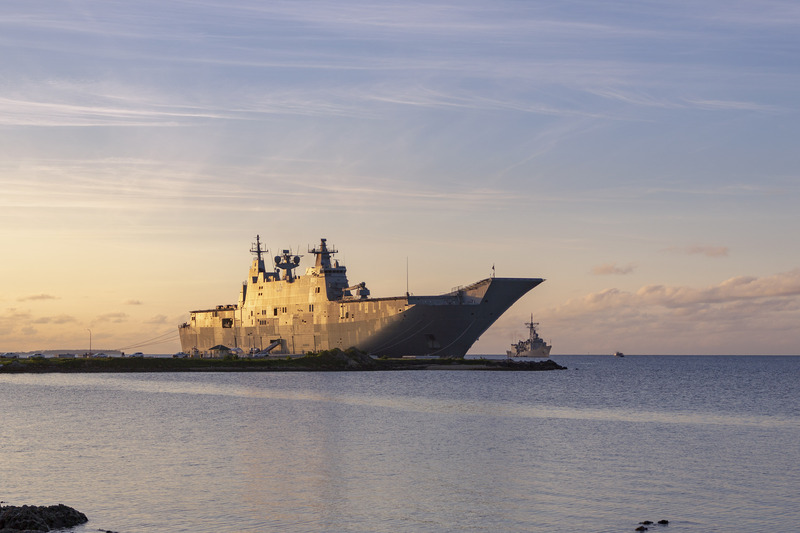 HMAS Adelaide berthed alongside Vuna Wharf with HMAS Melbourne anchored nearby at sunset in Nuku’alofa, Tonga, as part of Indo-Pacific Endeavour 2018. Royal Australian Navy photo. Already the Australian Defence Force’s amphibious force has proven itself on an international stage. After success at 2016 RIMPAC, the ADF took on an inaugural Indo-Pacific Endeavour deployment last year. “Indo-Pacific Endeavor is our principle vehicle for international engagement and regional engagement from a military-to-military point of view, and also to support Australian … diplomatic efforts overseas and Australian interests overseas,” Capt. Jon Earley, commanding officer of HMAS Adelaide (L01), told USNI News on July 22, while underway in Hawaii for the RIMPAC 2018 exercise. “Adelaide led IPE 17 last year; the focus was Southeast Asia and Northeast Asia, and that was a six-ship task group” that, while both aggregated as a task group and then disaggregated into smaller groups, visited 13 countries and worked with 15 militaries in the region. This year, Adelaide is participating in RIMPAC 2018 as an intermission to its IPE 18 event in the Southwest Pacific. The amphib and its escorts visited Fiji, Tonga, Samoa and Vanuatu on the way to Hawaii, and will visit the Solomon Islands and possibly Papua New Guinea on the way back home. “The main driver there was for Australia to promote stability and security in the region, achieved through bilateral and multilateral training and also capacity-building,” Earley said. 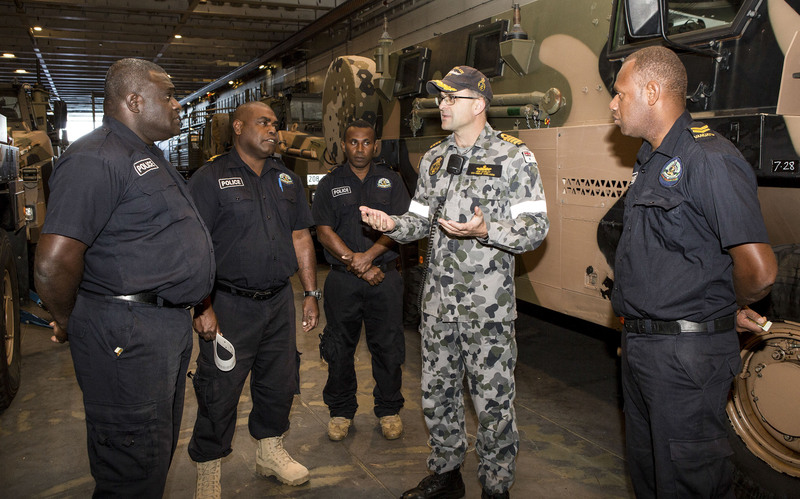 Commanding Officer HMAS Adelaide, Captain Jonathan Earley, CSC, RAN, talks to members of the Vanuatu Police Force Maritime Wing, (l-r) Corporal Nixon Masanga, Sergeant Garry Aru, Police Constable Simon Timothy and Corporal Ezra Tomatvativolivol, during Indo-Pacific Endeavour 2018. Royal Australian Navy photo. Though most of the focus is on humanitarian assistance and disaster relief capabilities, the Australians, like the U.S. military, are also looking to support their interests overseas, and in particular in the South China Sea. “We have an interest there. We support international world order, rules-based organizations. We expect people to respect the ocean, look after the ocean, make sure it’s not used for the wrong purposes – like any navy would. So we do have an interest going up there,” Earley said. Earley made clear that Adelaide had only professional interactions with the People’s Liberation Army Navy (PLAN) while in the South China Sea – waters that the Royal Australian Navy have patrolled for decades – with Chinese ships tailing them at times but also with plenty of positive radio communication to ensure all ships were aware of each other and operating safely in close proximity. Earley said these operations far from home would never rival what the U.S. Marine Corps is able to do in terms of scale, but he did say international leaders were taking notice. HMAS Adelaide’s landing craft perform manoeuvres off Nuku’alofa, Tonga, in preparation for amphibious training exercises held on Pangae Motu Island, during Indo-Pacific Endeavour 2018. Royal Australian Navy photo. Next year’s IPE 19 will focus on the Indian Ocean, with Canberra leading a task group to visit India, Sri Lanka, Indonesia and others. IPE 20 will return to the Southeast Asia focus, including the South China Sea, and IPE 21 would likely revert back to the Southwest Pacific like this year’s deployment. Sergeant Andrew Rimmer, 2nd Battalion, Royal Australian Regiment, waits to board a United States Marine Corps CH-53E Super Stallion Helicopter onboard HMAS Adelaide during the final amphibious assault for Exercise RIMPAC 2018. Royal Australian Navy photo. As the Royal Australian Navy’s understanding of how to operate an amphibious force in the Pacific matures, so too has the Australian Army’s vision of how to man and train the pre-landing force and ground combat element. The Army decided early on that it would not create a new service to support amphibious operations, like the U.S. Marine Corps, but would instead devote a single battalion to specializing in amphibious operations. At the conclusion of a set of trials last year, the Army tweaked its model a bit – 2RAR (amphibious) would be the dedicated pre-landing force, and the rest of the Army’s six battalions would rotate on an annual basis who would serve as the on-call ground combat element. 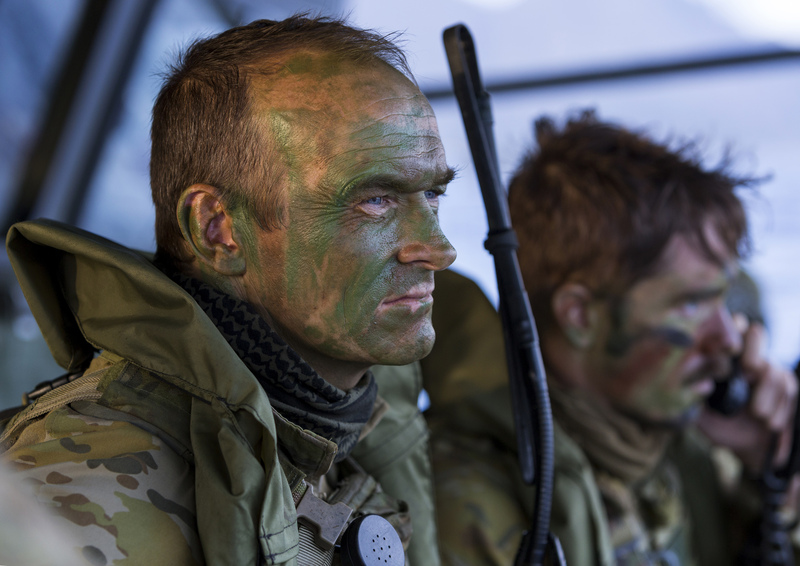 “At the end of that trial … the Army decided that, okay, there’s some areas in the capability that we can take some risk in, other areas we can’t,” Lt. Col. Douglas Pashley, commanding officer of 2RAR (amphibious), told USNI News in a July 22 interview aboard Adelaide. Commanding Officer, 2nd Battalion, Royal Australian Regiment, Lieutenant Colonel Douglas Pashley, in on of HMAS Adelaide’s Landing Craft during the final amphibious assault for Exercise RIMPAC 2018. Royal Australian Navy photo. 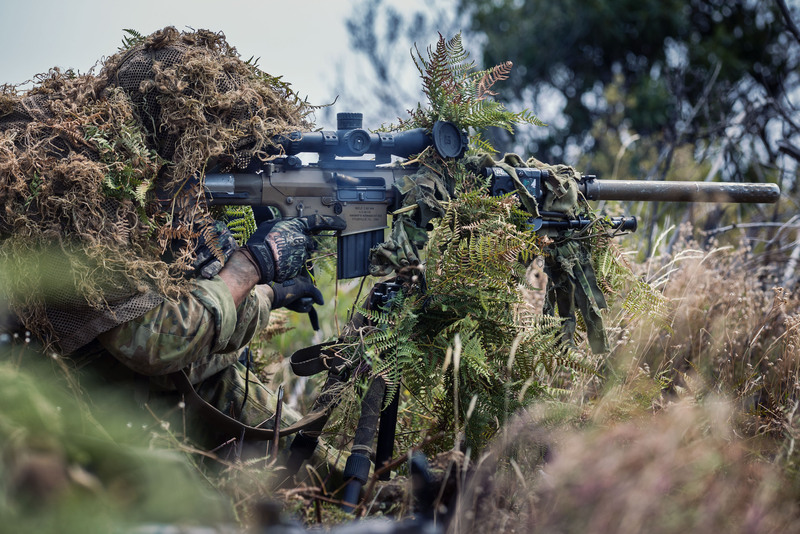 The 350 or so soldiers of 2RAR (amphibious) are primarily infantry soldiers but also include artillery specialists, maintainers and mechanics, ordnance support personnel, snipers, small-boat operators, direct fire support personnel and more. Pashley said the force is on the smaller side, compared to other countries’ comparable amphibious forces; the Army may eventually add a few more niche capabilities, but for now he said 350 is about the right size for what Australia wants to do. 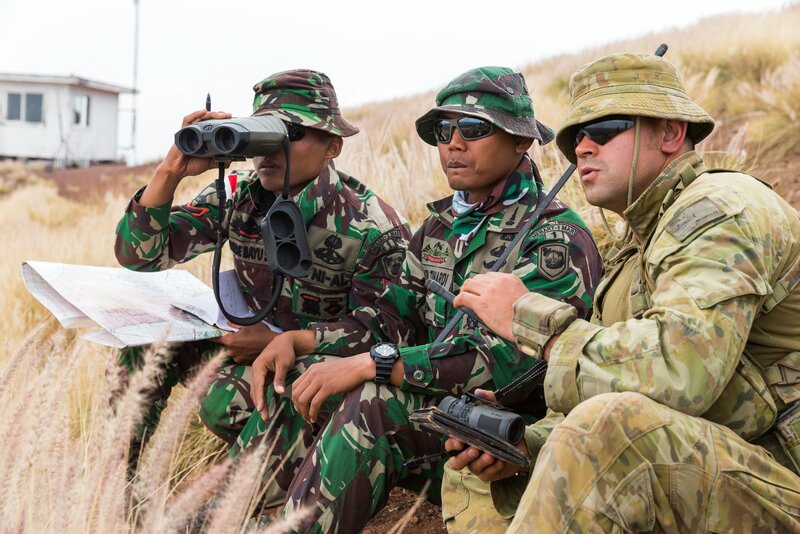 (Right) Australian Army officer Captain Christopher Moroney, from the 2nd Battalion (Amphibious), Royal Australian Regiment, works with Indonesian Joint Terminal Attack Controllers to call in artillery fire at Pohakuloa Training Area during Exercise Rim of the Pacific 18. Australian Defence Force photo. Though on a smaller scale, Pashley said his goal for 2RAR (amphibious) is to serve as something akin to the U.S. Marine Corps’ 1st Reconnaissance Battalion. “I’m really keen to push the unit to become a world-class pre-landing force unit. The aiming mark I have set for the guys and girls in 2RAR is 1st Recon Battalion, U.S. Marine Corps. They’re an incredibly capable unit with a rich history of performance, and I think that’s what our aiming mark should be,” Pashley said, noting the unit’s attitude of setting high standards for themselves. Australian Army soldier Private Blake Field from the 2nd Battalion (Amphibious), Royal Australian Regiment, fires on a target during a sniper range practice at Pohakuloa Training Area as part of Exercise Rim of the Pacific 18 (RIMPAC 18). Another benefit of the refined setup is for the soldiers serving as the rotational ground combat team – similar to the U.S. Marine Corps, where units are assigned to serve as the Marine Expeditionary Unit to accompany amphibious ships. “What I’ve seen in my short time on the job is that amphibious operations just makes you better at doing your normal job on the land, because if you can work in a multi-domain organization where you have real constraints, you have to get things right, you have to synchronize, it’s pretty easy when you go on the land,” Pashley said. One battalion within the Royal Australian Regiment is always the “ready” force, on call to deploy on short notice if needed. The Army determined it was more sustainable to add to this list of on-call responsibilities – adding a certification event in amphibious operations so that battalion could serve as the landing force if needed – rather than ask a second battalion to also be in a ready state as a separate amphibious landing force. 8/9RAR is the current on-call landing force, and next summer 7RAR will be certified to take that role for the next year. “I won’t be doing this job next year, unfortunately, but I am just licking my lips to see what the capability can become, when you’ve got the three amphibious ships, you’ve got a professional C2 headquarters with the amphibious task group headquarters, you’ve got a professional and dedicated pre-landing force, you’ve got a rotating [ground combat element], plus you’ve got a capable air combat element, which we’re going to take a big step with next year with the inclusion of attack aviation,” Pashley said. 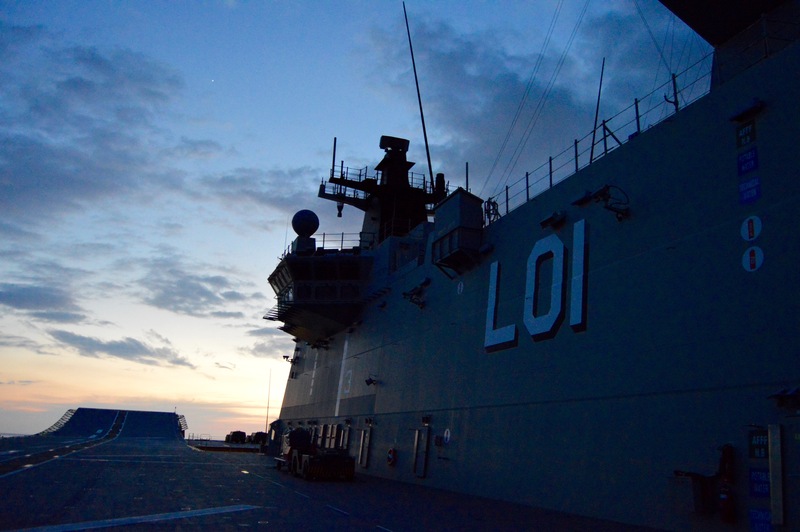 HMAS Adelaide (L01) participates in the Rim of the Pacific 2018 exercise in Hawaii. USNI News photo. Though there had initially been some concern about the culture shock of 2RAR being the amphibious force – many of the soldiers assigned to the unit early on would have signed up for the Army expecting a traditional ground force job, and may not be happy about serving aboard a ship at sea – Pashley said his soldiers seem to like the niceties of life aboard Adelaide and sister ship Canberra. “They would much prefer to be on a ship: planning, training, come off the ship, execute a mission or a task over two, three days, not much sleep, then come back on the ship and shower, sleep, go to the gym. So that’s an attractive promise,” he said, compared to lengthy missions on the ground at bases or remote outposts. The soldiers serving aboard amphibious ships do get paid more, he said, but the soldiers seem to appreciate the opportunity to work with helicopters, landing craft and other assets that any other soldier would never interact with. 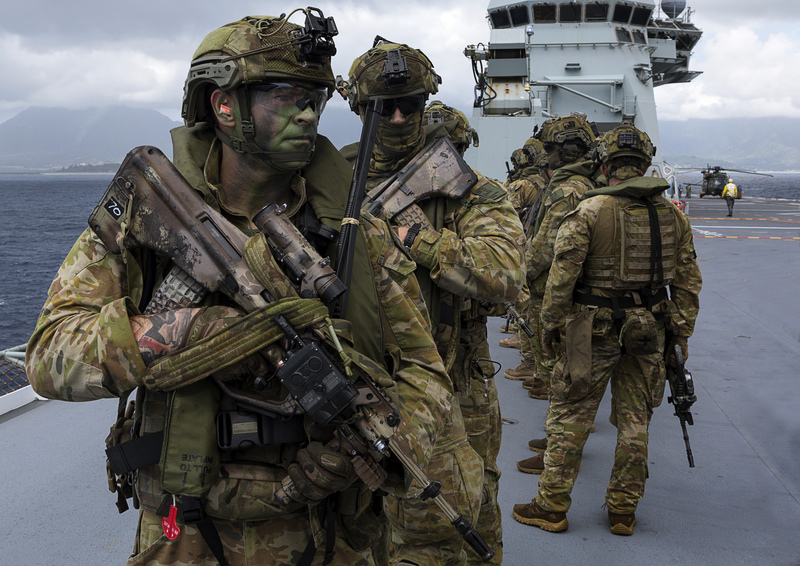 Soldiers can request to serve in 2RAR (amphibious) through their chain of command, and Pashley said major events like RIMPAC – in addition to showing off their capability on the world stage – also serve as a good recruiting tool. “I think we’re pretty early in our journey, so we’re really working hard to make it a place that people want to come to, to show people what we’re doing, and this exercise is really important for that,” he said. 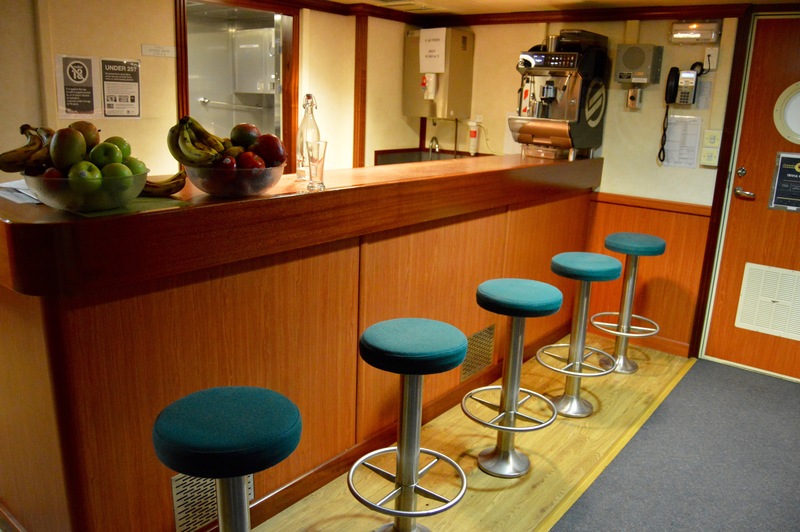 The wardroom aboard HMAS Adelaide (L01) features a coffee and drink bar, along with meeting space, a tv lounge and room for cards and dice games. USNI News photo. 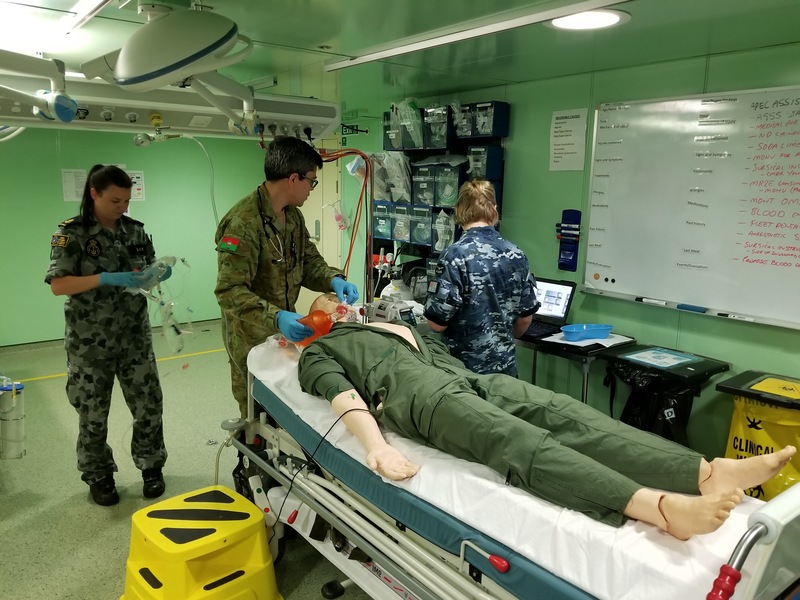 USNI News spent about 24 hours onboard Adelaide, and the appeal of serving aboard the ship was apparent. The 757-foot ship has accommodations for about 400 crew – about a sixth of whom are Army, the rest being Navy – and 1,000 embarked personnel for whatever mission type the ship needs to conduct. Many officers have two-person staterooms, and embarked forces stay in 15-person rooms. The two-year-old ship boasts many creature comforts not even found on American big-deck amphibs: officers eat in a dining room serviced by culinary staff that take orders from a menu and deliver food to the tables. 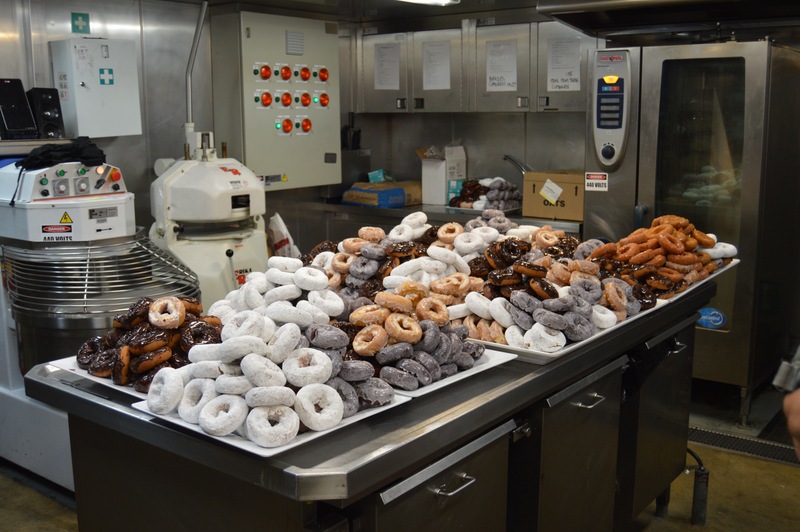 The 23 chefs cook about 4,000 or more meals a day, and on the day the embarked forces returned to the ship after two or three weeks at an ashore training area, the chefs baked about 2,500 donuts for them as a morale-booster. A massive wardroom boasts a tv area, meeting space, and a bar setup – most often used for coffee, with a barista coffee machine that officers joked was the most-used piece of equipment on the ship, but also for the occasional beer. (The crew clarified that, yes, beer is technically allowed on Australian warships, but may be consumed only in port at the discretion of the commanding officer. Still, the wardroom features a beer fridge decorated with cartoons about Australia’s famously deadly wildlife). 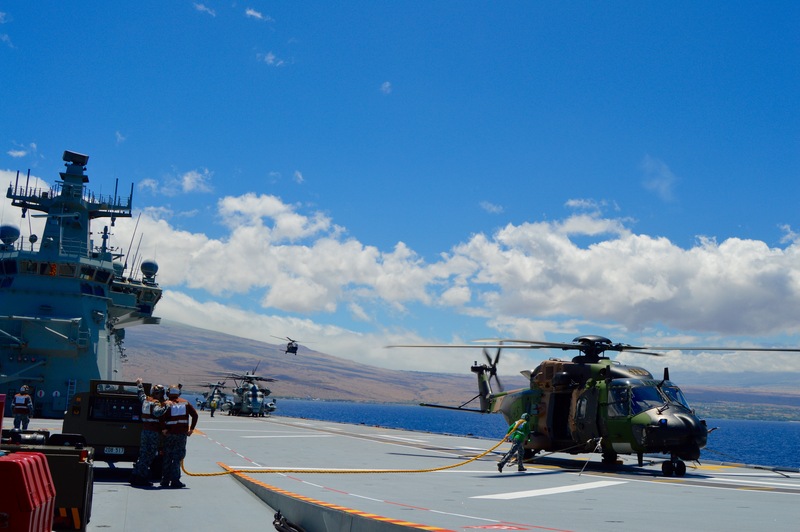 Australian MRH90 and U.S. CH-53E helicopters land aboard HMAS Adelaide (L01) on July 22 during the 2018 Rim of the Pacific exercise in Hawaii. USNI News photo. The amphib’s flight deck features six helicopter landing spots, and the hangar can store eight more. Its ski jump ramp – a remnant from Navantia’s design of the Spanish Navy’s Juan Carlos I (L61), which requires the ramp to launch AV-8B Harrier II jets – serves no practical purpose, as the Australian Defence Force currently has no plans for fixed-wing aviation operations from a ship. Personnel aboard the ship said maybe one-day operations would evolve to include fixed-wing manned or unmanned vehicles, or maybe one day the ramp would be smoothed out during a ship overhaul period. For now, since helicopters cannot land on it, the only real purpose the ramp serves is to make morning runs on the flight deck more challenging. The ship also has a light vehicle deck that can hold upwards of 100 vehicles, as well as a heavy vehicle deck for tanks. Chefs aboard HMAS Adelaide (L01) baked 2,500 donuts for the embarked ground forces when they returned to the ship after training at an ashore range during the 2018 Rim of the Pacific exercise in Hawaii. USNI News photo. The well dock, the centerpiece of the ship’s amphibious capability, proved to be a particularly effective pairing with U.S. Marine amphibious assault vehicles, which the Australian Defence Force does not currently field. The ADF does have a Navy and Army variant of a LHD Landing Craft connector, akin to the Navy’s landing craft utility. Also important to an amphibious mission is the ship’s medical capabilities. Whether taking care of casualties in the early stages of an amphibious assault, or – more likely – tending to victims of a natural disaster or other crisis, the ship rivals many community hospitals in Australia in terms of the sophistication of the capability, ship CO Capt. Earley said. The ship has two operating rooms, can hold 20 medium-care patients and 28 low-dependency patients, and has a dental facility, pharmacy, x-ray and radiology services and more. Royal Australian Navy Leading Seaman (LS) Medic Estele Day (left); Australian Army Maj. Jonathan Begley, an anesthesiologist; and Royal Australian Air Force Flight Lt. Katie Hall, a nursing officer; demonstrate life-saving techniques on training dummy “Simon” aboard HMAS Adelaide (L01) on July 22, 2018, during the Rim of the Pacific exercise in Hawaii. USNI News photo. Senior Medical Officer Lt. Cmdr. Richard Classon told USNI News that “an unbridled HA/DR (humanitarian assistance/disaster relief) natural disaster” is the most likely “nightmare scenario” his medical team would face, given the region of the world they operate in. Still, because Adelaide is a warship, the medical team does train for higher-end events, too. “If the ship did get hit by a [chemical, biological, radiological or nuclear] threat, we’ve got to be able to 1) isolate it, and 2) look after ourselves. That could be a mass casualty situation very very quickly. How do we get dirty patients into the hospital to do surgery on them?” Classon said.